UPDATE: Russia has lifted the ban on Belarusian milk products. Shipments should resume on June 18, 2009. A milk war is brewing. After Russia banned the import of milk products from Belarus on June 6th, relations between the two countries have become increasingly strained. The situation escalated when Belarusian President Alexander Lukashenko withdrew from attending a meeting of the Collective Security Treaty Organization on Sunday, a group idealized by Russia as a counterweight to NATO. Defense expert Aleksandr Golts examines the conflict, delving into its roots and questioning Russia’s intentions and need for a regional alliance like the CSTO. The article first ran in the Yezhednevny Zhurnal online newspaper. Do you remember the old joke, how in the Red Square, after the intercontinental rockets, a column of people with deer-skin hats and briefcases in their hands march out, walking in step. “And here are the Gosplan workers,” the announcer triumphantly declares, “our most destructive weapon.” As recent events show, now, after the rockets, people in white lab coats with technical regulations tucked into their arms –our health inspectors—should be sent in the parade. Even before now, I knew that [Chief Sanitary Inspectors] Gennady Onishchenko was an incredibly influential, and most importantly, independent civil servant. Fighting for the health of people under his jurisdiction, he prohibited the import of Moldovan wine and Georgian Borzhomi [mineral water] without compromise. And to the fact that these bouts of fighting for the nation’s health only made an appearance when Vladimir Putin was taking offense at the Moldovan and Georgian president– well, this was certainly just a random coincidence. And when, despite the absence of a Belarusian delegation and an objection from Uzbekistan, five governments signed documents defining the system of how the CRRF would function, be formed and implemented, Minsk clearly and explicitly declared, that the adopted resolutions were illegitimate, since they were adopted without consensus, contrary to the [CSTO] charter. In reality, this is a condemnation of the CSTO. Minsk, in a state of extreme aggravation, somehow managed to say the bare truth: the ability to receive money from Russia is much more important to Belarus then any collective work to repel some mythical military threat. Two types of security organizations exist. On the one hand, there is a military alliance. The necessary condition is a common military threat to all participants, whose presence smoothes out internal conflicts. NATO was created on these principles, and as soon as the USSR fell apart, the North-Atlantic alliance faced an identity crisis. Members of the CSTO have different threats. Armenia has Azerbaijan. The Central Asian governments have the expansion of radical islam from Afghanistan. As well as the internal instability of weak authoritarian regimes. And whatever resolutions about rapid response forces may be adopted, it is still impossible to imagine Kazakh commandos fighting on Armenia’s side against Azerbaijan, or Belarusian paratroopers deploying into Uzbekistan. The second option is an agreement between countries that are suspicious of each other’s intentions. The OSCE can serve as an example of such an alliance. In this case, the participants should agree on common rules of conduct, measures of mutual trust. It must be said, that the mutual relations of the CSTO member-states are far from perfect. Literally a week before the summit, Uzbekistan began to raise seven-meter-tall [23 foot] walls and digging a trench on its border with Kyrgyzstan. And in earlier times, Uzbekistan mined all of its borders with Tajikistan. Nevertheless, the question of measures of mutual trust has never been put before the CSTO -it isn’t customary for allies to openly speak about their mistrust for each other. As result, the CSTO is not too useful for repelling an external threat and pointless for supporting domestic security. In actual fact, the CSTO is a reflection of the hang-ups that Russian leaders have. Those cursed “Yankees” have scores of allies—anyone wants to form an alliance with Washington. But Moscow has no one, and consequently needs to force the former Republics of the USSR to enter into an allied relationship with Russia. The presence of actual threats is not important, and neither is geographic location. As result, states that are thousands of kilometers apart have ended up in the CSTO. Setting up military interaction with them is physically impossible. The CSTO in essence represents a set of two-sided agreements between individual countries and Moscow. Fundamentally, these agreements are not at all about security threats. They simply show the readiness of these states to play out a ritual gesture of homage to the Kremlin leadership in exchange for Russian money. Alexander Lukashenko worked out what was in his mind the ideal system of relations with Russia. He regularly declared a readiness to reinforce joint defense against NATO, receiving billions from Russia in return. Concurrently, the money went to subsidize Belarusian industry, which then sold to the same Russia at artificially lowered prices. The crisis, however, somewhat changed the situation. Russia had less, much less money. And Moscow tried to at least somewhat control the billions of dollars being sent to Minsk. As result it received milk and meat hysterics. In truth, Lukashenko was honestly keeping his end of the bargain, reciting his intention to resist the non-existent NATO threat. And the Kremlin didn’t wish to pay for it. And “batka” [a slang word for Lukashenko, lit. father] immediately showed that milk and meat relations were far more important for him than all of this rubbish about joint defense. Read once more into the Belarusian statement: It is pointless to adopt resolutions about reinforcing military and political security, while Belarusian economic interests are suffering. I haven’t read such an honest political statement in a long time. 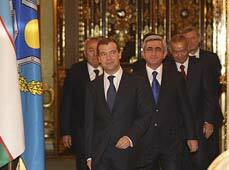 Equally egoistic is the approach of Uzbekistan, which refused to sign the CRRF agreement. Tashkent is very concerned that these agreements will open the doors for interference in Uzbekistan’s internal affairs, where as is plainly evident, a social implosion is imminent. And the possibility of such interference, frankly speaking, is Russia’s only rational interest in the realm of security. Internal conflicts in Central Asia can result in an enormous amount of refugees, and at the same time a sharp growth in the illegal trade of narcotics and arms, as well as armed gangs entering onto Russian territory. To answer these real threats, Russia would do well to negotiate articulate, mutually binding two-sided agreements with the problem states. And as for the CSTO, then as an extremely artificial construction, it will live only as long as Russia can pay its partners without demanding money in return. I suspect that in the near future, Onishchenko will have plenty of occasions to demonstrate his world-famous commitment to principles.